At once intoxicating and exciting London four-piece Mellow Gang made a big impression on me earlier this year with their sumptuous debut single ‘Lagoon (Solina)’. Their EP, ‘Play’ (released June 23rd), throws more light on the evocative corners of their soulful, dreamy psych-pop sound, we are pleased to have the premiere of the four track EP below. Lagoon (Solina) is the dream-like sound of falling down a swirling wormhole to the bottom of a pool, before coming up for air, woozy reverb soaked guitars, soulful female/male vocal harmonies that give voice to emotional epiphanies. “I’m trying,” goes the refrain which captures a moment of reflection: peering through the tricky mist of life to the light, it sounds like a plea for mercy as this delightfully sea-sawing rhythm and twinkling chimes reaches a crescendo of tumbling drums. Every corner of ‘Play’ is invigorated by the intrepid, evocative production of late 60’s psychedelia. Bandmates Shen, Nick GK and Joe Wood craft an infectious blend of psychedelic rhythm & blues, informed by their experience performing under the previous outfit Venice Trip. 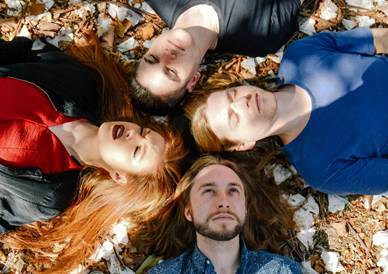 Stretching into even more ambitious, beautifully crafted reverb drenched pop music here with Mellow Gang, they deliver spellbinding instrumentation gorgeously sensuous percussion framing beguiling vocals. It’s an intoxicating sound led by Welsh singer Harriet Joseph’s soulful tenor. She fills these atmospheric string led songs with a mysterious melodrama, casting haunting shadows across the doleful ‘Mirrored’ while the soulful blast of exquisite new single ‘Vendetta’ – simmers with tension and obsession. Her cool detachment wells up into a wail of emotional anguish on ‘My Last’. She sounds tragic and beautiful throughout, luxuriating in a half-awake space between dream and reality, emotional pain and revelation that makes ‘Play’ feel both steeped in musical history yet refreshing, exciting and peering forwards.